"NBA 2K is the first installment of the NBA 2K series. It was published by Sega Sports and developed by Visual Concepts. 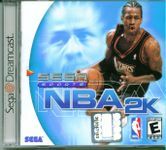 The cover features Allen Iverson. The game features Exhibition, Seasons, Playoffs, Practice, and Customizations. In Customizations, the player can create a fake or real NBA player and/or team. They may also change their team's starting lineups. Also, players can trade rosters. You can also import created players and teams to another person's Dreamcast." Source: Wikipedia, "NBA_2K_(video_game)," available under the CC-BY-SA License.